Cap was Kirby’s favorite … and you’ll find out why. 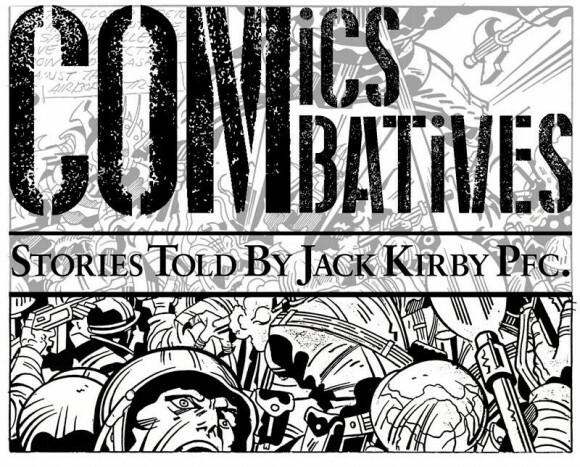 I’m really looking forward to presenting my new VisuaLecture about Jack Kirby and Captain America — Kirby’s favorite character! 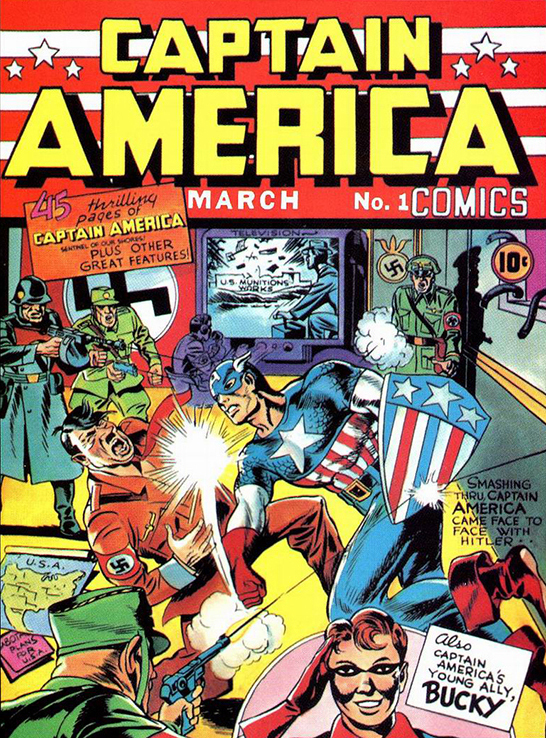 I hope to capture and relate that in my presentation, a master’s class on Kirby—using Captain America as the primer. 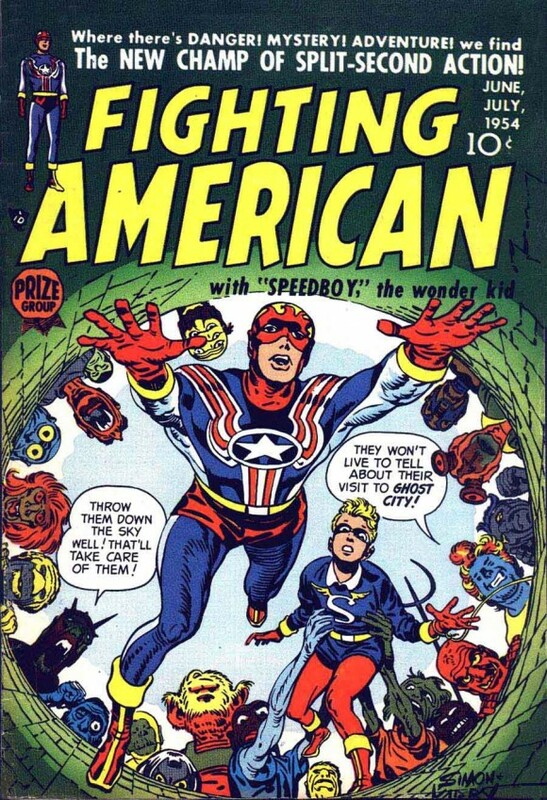 I’ll be focusing on all the major eras that Kirby worked on the character: from his first collaborations with Joe Simon in the 1940s; his Captain America knockoff, the Fighting American, in the ’50s; his return to the character at Marvel Comics in the ’60s; and concluding with his second Marvel stint in the ’70s. 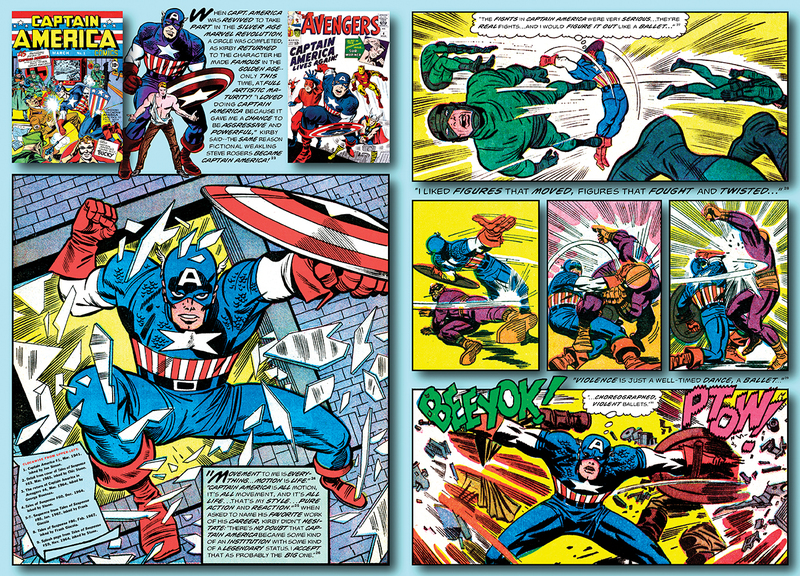 In each iteration of Captain America, Kirby refined his approach to dynamic action and the staging of ferocious and furious fight scenes on the comic-book page. He worked to maximize motion, power, energy and explosiveness, using Captain America as his (boxing) canvas. You’ll see Cap go from a more wiry, boxer’s body in the Golden Age, to a bigger, bulkier model as Kirby’s mature style emerges in the Silver Age. And at each stage of Captain America’s development, I’ll dissect how Kirby’s artwork itself accomplished the feat of making lines on paper perform as they did, making two-dimensional figures come to life, leaping across panels and pages. I’ll discuss the varieties and vagaries of Kirby’s various inkers on Captain America, and how they did—or didn’t—do Kirby’s powerful pencils justice. By the end of my two-part, 90-minute presentation—separated by a surprise screening in the half-hour intermission—you’ll come to know how and why Captain America was Kirby’s favorite. You’ll see the Captain America comics you might already know projected and sequenced in a way to make you see them new and fresh. You’ll see comics as you’ve never seen them before. This ain’t your father’s art history lecture! And to all those who can’t be in the New York metro area on Sunday to see CAP ’N’ JACK “live,” I’m excited that, thanks to our friends at the pop culture site Den of Geek, it’ll be live-streamed! Click here for more info. And for more info on the Kirby Museum, click here. 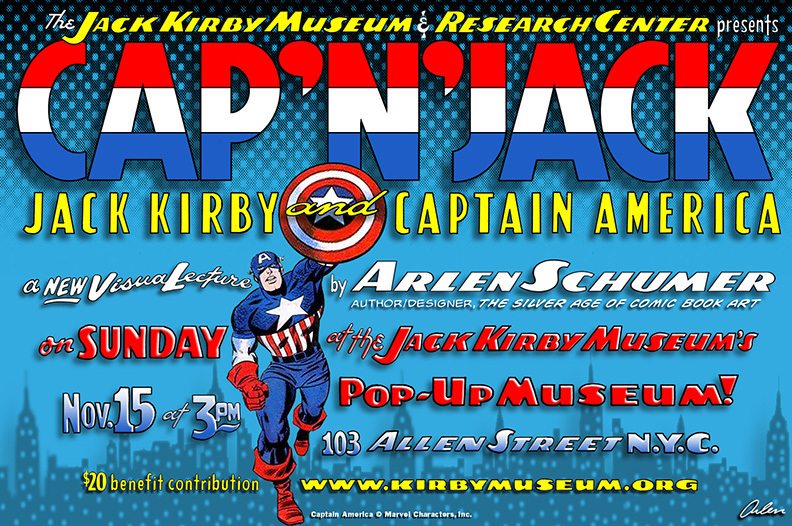 The Jack Kirby pop-up museum on the Lower East Side — the neighborhood where Ya’akov Kurtzberg was raised — is located at 103 Allen St. It will be open for three weeks, until 11/29. 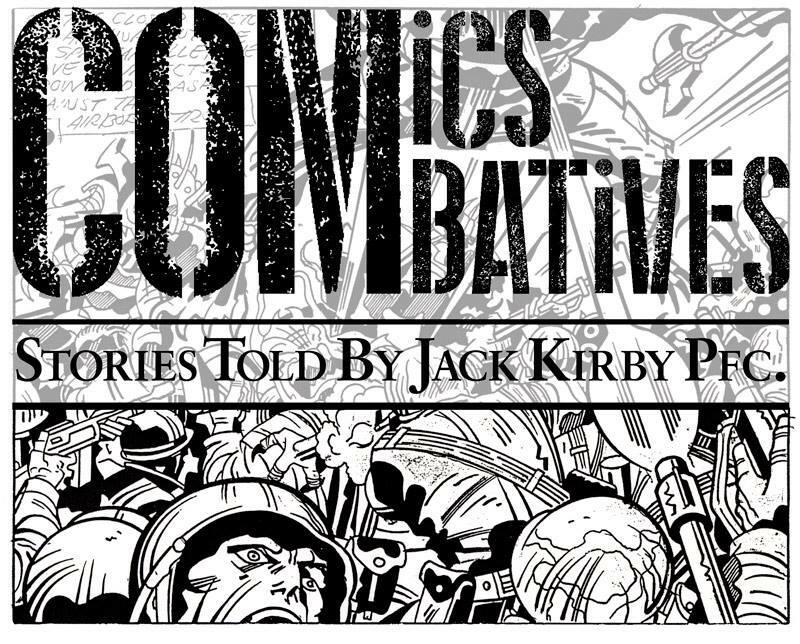 This year’s exhibition is titled Comics Combatives: Stories Told by Jack Kirby Pfc. 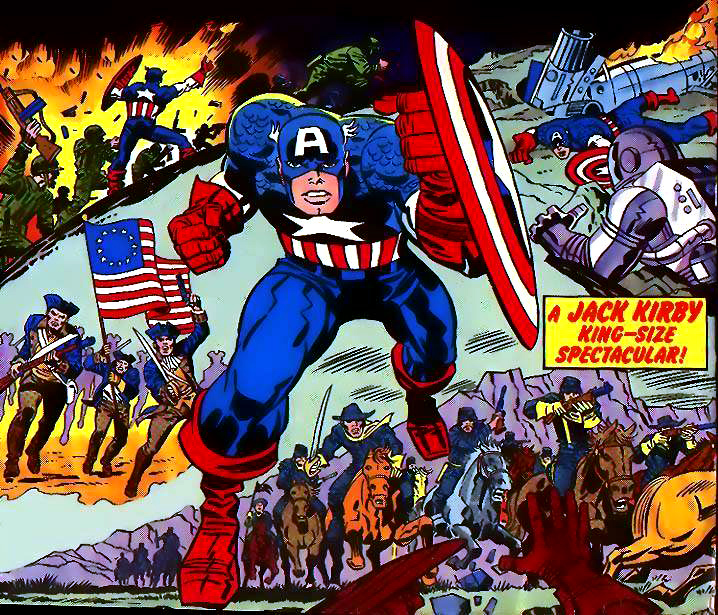 The show’s theme is built around Kirby’s depictions of heroic combat, in both war and superhero comics. Sunday’s event is at 3 p.m. Admission is $20. 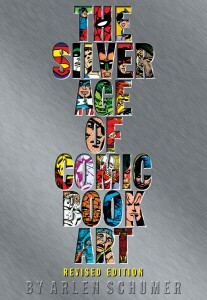 Arlen will be signing his coffee-table book The Silver Age of Comic Book Art at the event. And you can also take advantage of the holiday sale he’s having at his site: Buy a signed and sketched-in hardcover and get a Silver Age of Comic Book Art T-shirt for free! Click here for details.